This past week, Lifehacker ran a fantastic post showing how to creatively display power cords instead of hiding them. 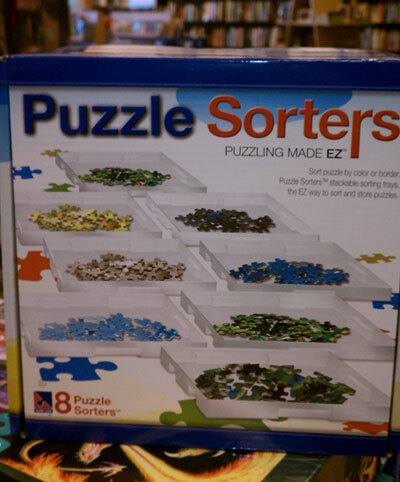 … a set of 8 plastic (of course) “sorting trays” to assist in doing puzzles. Now you can put all the pieces of similar colors into these trays instead of putting them on the table like countless other puzzledoers have been doing for generations. And, if square trays aren’t your style, you can also get them in oval! At first, I thought maybe they were a teaching tool for young children. Except, the box and product description clearly state that they’re not appropriate for people under the age of 12. Like Megan, I’m stumped as to why someone would need these. If having sorting trays were really important, couldn’t saucers or salad plates (which you may already own and rarely use) or paper plates (100 for 1/3 of the price) work? At least with paper plates you could write on them to explain exactly what type of pieces you have in that pile. You can’t easily write in a non-permanent way on plastic trays. Finally, I’m starting to find that any device with the word “EZ” in the title is usually worth considering for a unitasker submission (e.g. the EZ Cracker). Thanks, Megan, for taking a few minutes out of your Barnes and Noble trip to share this with us. Each year when putting together our Holiday Gift Giving Guide, we look for a theme to unify our selections. This year, we decided to focus on items that get a lot of bang for their buck. We want to suggest items that someone on your list might use daily or nearly every day. We’ve been referring to these as high utility gifts, and they’re amazing when you can find them. Over the past five years, we’ve included many non-tangible gifts in our Gift Giving Guides — experiences, charitable giving, etc. — and we still think these are wonderful gifts to give. In fact, many of the gifts I plan to give this year don’t come in a box. Check out our 2010, 2009, 2008, and 2007 Guides for dozens upon dozens of these types of suggestions. However, just because something does come in a box, it doesn’t mean the gift is clutter. A high utility gift appropriately matched to the right person can improve his or her quality of life. If your mother is using rusty, warped, and unsafe knives in the kitchen, getting her new knives that will keep her out of the emergency room can be a big improvement to her daily cooking routine. Stay tuned this week and next as we explore high utility gift giving. We have some terrific suggestions headed your way. 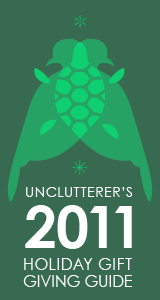 And, if you’re ready to go shopping right now (it is CyberMonday, after all), check out our guides from past years for uncluttered inspiration: 2010, 2009, 2008, and 2007. Are the gifts you plan to give able to help the people on your list every day? Can the gift improve their quality of life? 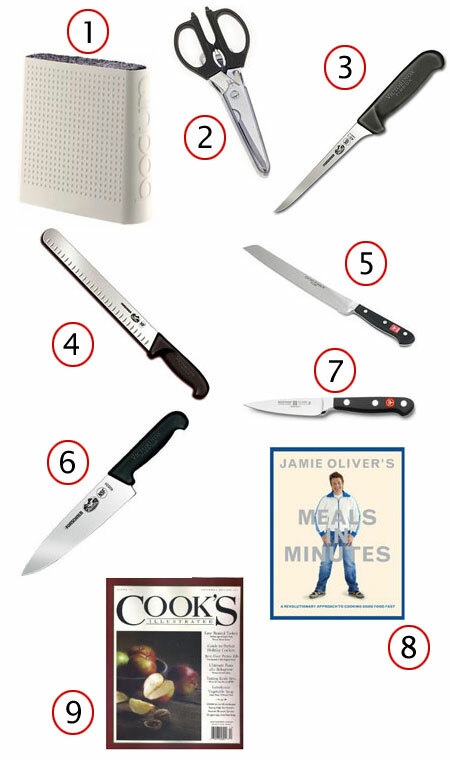 These are the questions we’re asking of each item in Unclutterer’s 2011 Holiday Gift Giving Guide. 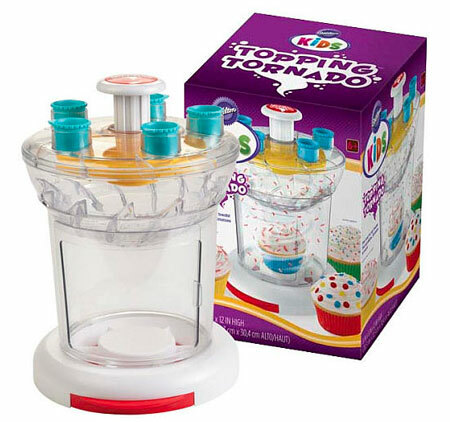 The purpose of this gigantic plastic device is to evenly distribute sprinkles on top of an iced cupcake. You’re not missing anything, all it does is shoot sprinkles at a cupcake. Today’s post is written by Sally Jacobs, the Practical Archivist. She has worked on archival collections at the Library of Congress Prints and Photos Division, the Wisconsin Historical Society Archives and American Girl. Thank you, Sally, for agreeing to share your amazing, in-depth knowledge of archival procedures with us. 1. Handle your photos carefully and safely. Ever wonder why archivists wear white gloves? I use mine so often I wash them and store them in my underwear drawer. Human hands contain oils and salts that can damage photographs, and cotton gloves are an easy barrier to protect photographs. If you’ve seen as many 19th century photos as I have, you’d never forget that a fingerprint that’s invisible today will eventually become an impossible-to-ignore brown stain in the future. White cotton gloves are a simple and inexpensive solution. You can buy them online from suppliers like Uline.com. If you truly can’t stand to wear gloves while you work on your photographs, I have an alternate suggestion. Wash your hands with soap before you start working, and be sure to wash them again after you take any break. Also, don’t put on hand lotion until you’re finished working with your photos for the day. Other than that, be careful where you place your fingers and try to hold prints by the edges only. 2. Store them in the right spot. I’ll skip the long boring lecture about temperature and relative humidity and cut to the chase. Like Goldilocks, you want a spot that’s not too hot, not too cold, not too wet, and not too dry. High temperatures speed up the chemical processes that cause damage. Here’s a sobering thought: The rate of decay doubles with each increase of 18ºF. Doubles! High humidity like you find in basements and attics encourages mold and mildew, which can permanently stain and destroy photographs. Fluctuating humidity can cause the photos to crack because the paper backing and the emulsion absorb moisture at different rates. Basements and attics are also at high risk for flooding, and we all know flooding is bad news for any kind of treasure. So, what’s the right spot? An interior closet in a house that’s cooled in summer and heated in winter is a safe bet. Guest bedrooms and linen closets under stairs work for many of my clients. Under the bed can be a great location, as long as you aren’t putting your photo treasures next to a heating vent. Controlling temperature and humidity levels to a specific zone can be difficult and expensive to accomplish. Fortunately, you can offset what’s going on in a room by putting your photo treasures in archival boxes. This creates a micro-environment that offers protection from UV light damage, dust, and discourages pests. You can even use silica gel to remove excess moisture from the “micro-environment” of your box. Boxing up anything that is loose also protects your photos from folding, crimping, and collecting scratches that happen when a corner of one photo nicks off emulsion from a nearby print. Yes, in the sense that you want to use the kind of boxes used by professional archivists. But, also no, because the term archival is unregulated and therefore meaningless. Finding a product sold as archival tells you very little about whether it’s a safe environment for your photo treasures. 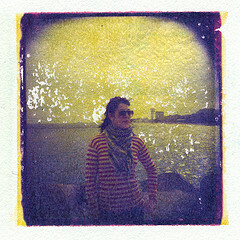 You probably know already that acids will damage paper and photographs. However, a true archival box is both acid free and lignin free. Lignins are a by-product of the paper-making process, and if they aren’t removed they will cause the paper to become acidic over time, even if it’s acid free today. When it comes to storing photographic prints and film (as opposed to letters and printed material) there is another factor you should consider for your storage materials. The safest boxes for storing photographs have passed the Photographic Activity Test, or PAT. This test is an independent third party test that uses accelerated aging to discover whether the box or envelope will interact with the photographs in any way. You can read more about the PAT in “What Archival Really Means,” an article/rant on my personal blog. Where can you find PAT-passed materials? Probably not at your neighborhood stationery store or scrapbooking supplier. You can find boxes, envelopes and folders that have passed the PAT in a dizzying array of sizes from archival suppliers such as Gaylord.com, HollingerMetalEdge.com and TalasOnline.com. I also sell an entire kit on my website, if you don’t want to track down individual pieces. (Note from Erin: It’s a nice kit, it’s actually why I asked Sally if she wanted to write a guest post for us. I saw it and thought, “I could really use that.”) If you do right by your photographs, they’ll be around for future generations to enjoy. And, since this week is Thanksgiving in the U.S., I recommend bringing along copies of your old photos to family gatherings — you can ask relatives to help you identify any unknown people and also enjoy looking at the images. It’s the Monday before Thanksgiving in the U.S. and if you’re at work, it’s very likely your brain isn’t. Oh look, Sharon from accounting brought in doughnuts! I really should talk about the game/movie I saw this weekend with ALL my coworkers! Now is a great time to make my holiday wish list! Shiny! File. Put on headphones (if they are acceptable in your workplace), and start putting papers away where they belong. If all your papers are filed, review your files to make sure you’re not keeping any information that doesn’t need to be archived. Organize your papers so that they help you do your job. Review your bulletin board. How recent are all those items hanging on the walls of your cubicle or bulletin board? Can you easily see all of the most vital information? Is the calendar from two years ago? Is there anything that can come down or be replaced? Clean your phone and work surface. When was the last time you scrubbed either? The dust bunnies behind your monitor aren’t going to clean themselves. Enter information off business cards. If you’ve recently acquired business cards from important contacts, enter the data into your address book. Backup your computer. If it’s not done automatically, now is a great time to backup the information off your computer’s hard drive. Be sure to follow your employer’s system for doing this task. 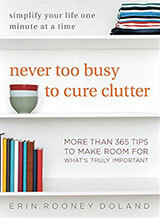 Unclutter your bookshelves. Do you have any out-dated manuals or irrelevant reading materials taking up space on your bookshelves? Now is a great time to recycle, shred, or remove these items from your office. Equipment check. Are you using all of your equipment in your office? Is it in its best possible shape? Could you benefit more by knowing how to better operate the equipment you do have? Make a request to have the item serviced or take the time to read the operator’s manual or get rid of anything you don’t use. Restock. Do you need more tape, more pens, more notepads, or any more office supplies? Go “shopping” in the supply closet if you do. Mindless work often gets a bad reputation as “not working,” but the reality is that you need some down time to let your brain process all that mindful work you are usually doing. 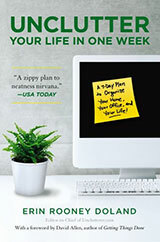 Researchers at the University of California, Davis, found that “alternating between mindful work (work that requires intense thought and focus) and mindless work (routine activities that require very little processing power) enhances your efficiency and creativity.” In the end, a little mindless work might actually help you do a better job at producing your mindful work — I call that a win-win. Yes, you read it correctly, this is a basement office. The light color carpet on the floor, the white wood furniture, and the pale blue (or maybe it’s lilac?) 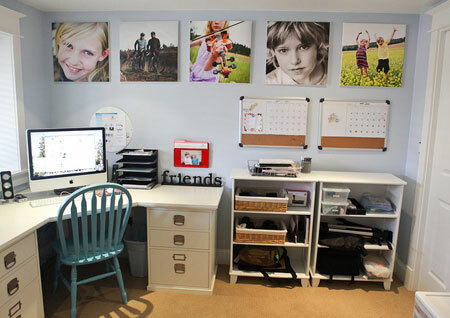 paint on the walls helps immensely to brighten this space and make it an inviting office. The five large canvas images add personality to the room without taking up space on the work surface. Camera bags, flashes, papers, and pens all have a place to live on the bookshelves. And, I love that even the trash can is out of the way, but conveniently located under the desk. In Michelle’s notes, she mentions that her husband’s desk is identical to hers, adjoins to the left side of her desk, and sits in the next corner of the room. It looks like a wonderful setup for a shared office. Thank you, Michelle.the.last.nameless for your inspiring submission to our Flickr pool. We all know that 2-liter bottles of soda are difficult to handle and unwieldy in smaller hands. Unfortunately, I can’t imagine a full bottle of soda could sit on that itty bitty stand and not fall over or off the counter and make an enormous mess. On the first use, I would end up wearing every ounce of liquid in the bottle. 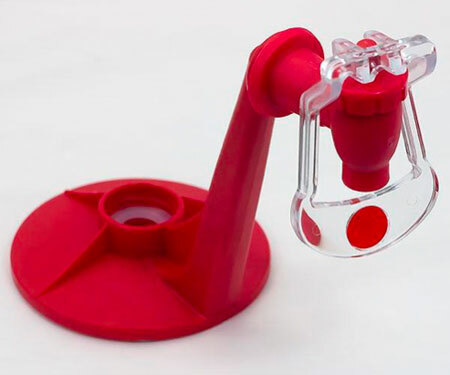 Plus, there would be little drops of soda on the counter or floor beneath the dispenser that would create a sticky blob. Who knows what would happen at a party of junior high students and a half dozen of these?! Heck, just looking at them I’m tempted to have a soda fight! I loved everyone’s entries for last week’s You write the commentary. You are a very creative lot of folks! But, alas, I had to pick a favorite. To all who participated, thank you. I had a really great time reviewing the entires.